Steven (Chicagoland, United States) on 19 March 2015 in Plant & Nature and Portfolio. Pictured here is the Persian Pool, located in the Aroid House of the Garfield Park Conservatory. Permanently on display here are Dale Chihuly’s 16 yellow lily pads. Just below the water, koi can be seen swimming in the pool. That is a lovely shot. I like the reflections in the water. What a stunning colors!! Wonderful Steven! These are amazing plants. They make a wonderful capture in this fine picture. Looks like a Disney cartoon. :) Lovely photo. This composition is so nice and so colorful, I want to see a jigsaw puzzle made from it, so I can piece it back together. It would be so fun. This is gorgeous and so refreshing ... looking forward to seeing the foliage come back! That is the coolest photo of lily pads that I have ever seen.... what a special place to visit! I love the koi and the abstract reflections, so cool! All is in harmony.... and an excellent visual!! Fantastic perspective created with such gorgeous flowers. Terrific. This is just beautiful! What a gorgeous setting! I bet the koi are happy there! Great arrangement! 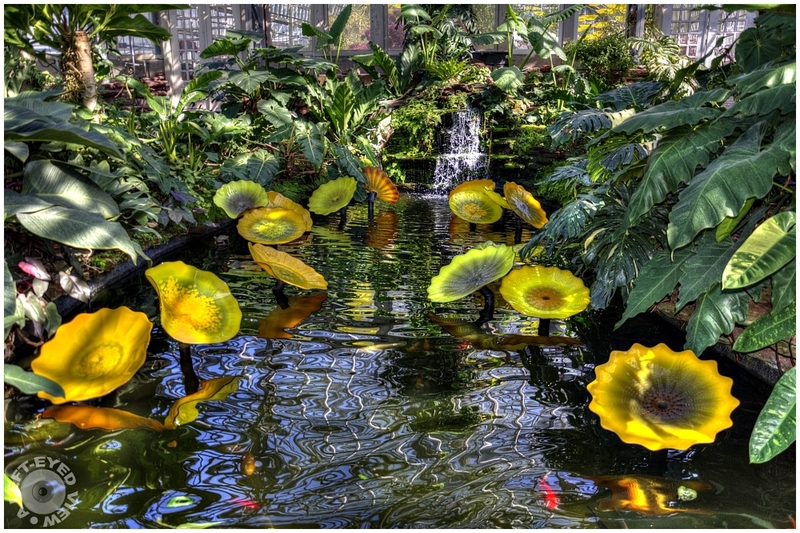 I love Chihuly's works and I think they have no better place than in a garden or park or conservatory! The reflection in the pool is magnificent! Excellent exposure! Everything is so bright and detailed. Lovely sculptures. C'est tout à fait génial ! Vif et coloré, entraînant !